Toll Brothers has filed an appeal to a ruling upholding a decision by township supervisors denying the building firm a conditional use application to construct a 319-house subdivision at the 322-acre Crebilly Farm located near the intersection of routes 926 and 202. Chester County Judge Mark L. Tunnell, Monday, upheld Westtown Township’s denial of the Toll Bros. conditional use application for a flexible development at the 320-plus-acre Crebilly Farm property on Route 926. Open space advocates are celebrating Monday’s decision by Court of Common Pleas Judge Mark L. Tunnell to uphold a decision by the township board of supervisors denying builder Toll Brothers a conditional use application to construct a 319-home subdivision, at the 322-acre Crebilly Farm. It’s anybody’s guess when a decision will be made in the Toll Bros. appeal of Westtown Township’s decision to deny the Toll’s conditional use application to develop Crebilly Farm. Attorneys for both sides, as well as attorneys for two intervenors, gave oral arguments before judge Mark L. Tunnell on Monday. Traffic and road improvements were the main topics of discussion during a hearing concerning an appeal by Toll Brothers in the bid to build 319 homes at Crebilly Farm in Westtown. Common Pleas Judge Mark L. Tunnell made no immediate decision on whether to overturn the unanimous December 2017 township Board of Supervisor’s decision to deny a conditional use application. A packed courtroom is expected at the Chester County Justice Center Monday for a hearing on the appeal of Toll Brothers of the denial of its plans to build a housing development at the Crebilly Farm site, property that residents have claimed as the “crown jewel” of Westtown that should be left largely untouched. For more than a year, opponents of the plan to erect 319 homes on a scenic, 322-acre tract had attended dozens of multi-hour meetings that produced almost 2,000 pages of testimony. They argued that the development would irrevocably harm the environment, exacerbate traffic woes, and desecrate land with Revolutionary War ties, rejecting the developer’s insistence to the contrary. Toll Brothers will appeal a Dec. 28 decision by the township board of supervisors to deny construction of 317 homes at Crebilly Farm. No court date has been set by the Chester County Court of Common Pleas to address the appeal. After weeks of silence about Westtown’s decision in December to deny Toll’s bid to build more than 300 homes on a Chester County farm, Toll has struck back. This week, the Horsham-based luxury home builder asked a Chester County Court judge to reverse the local board of supervisors’ decision and approve Toll’s application to build. Despite ardent opposition from area residents, Toll Brothers, one of the nation’s largest home builders, tried for much of 2017 to gain approval to build 317 homes on a Chester County farm, one that many have argued has ties to the Revolutionary War. A week after Westtown Township released its written decision denying the Toll Bros. conditional use application for the development of Crebilly Farm, the developer still has not commented. A few days before New Year’s, residents of Westtown Township, Chester County, cheered as their elected officials spiked a planned Toll Bros. housing development on a 322-acre privately owned parcel known as Crebilly Farm, where portions of the famous battle were believed to have been waged. After more than a year of debate, Westtown Township supervisors voted Thursday night to deny Toll Bros. its application to build a 317-unit housing development on Crebilly Farm, a 322-acre Chester County parcel that many have argued has ties to the Revolutionary War. Crebilly Farm has been saved – at least for now. Following the meeting, all three supervisors refused to comment until attorney Patrick McKenna makes it official and publishes a formal written decision on or before Feb. 12, when a 46-day time clock runs out. It is not yet known if Toll Brothers will appeal the ruling. It took five minutes for Westtown Township supervisors to end a year-long conditional use hearing when they voted to deny Toll Bros. application to develop Crebilly Farm. The 10-month long conditional use hearing process regarding Toll Bros. proposal to build 317 new homes on Crebilly Farm has come to an end. Westtown Township supervisors will announce their decision 6 p.m. Thursday, Dec. 28 at the township building, according to township solicitor Patrick McKenna. Monday’s meeting was reserved for public comment. During the meeting, attended by 150 concerned citizens at Rustin High School, all residents compelled to do so had their chance to be heard. More than 200 members of an engaged public attended the more than four-hour-long, ninth continued hearing concerning builder Toll Brothers’ proposed subdivision for the 322-acre Crebilly Farm, at Stetson Middle School Tuesday night. With the possibility of just one more witness addressing supervisors, the general public will get a chance to have a say at a meeting scheduled for Nov. 27 at 6 p.m. at Rustin High School. The ninth session of a conditional use hearing for the Toll Bros.-proposed development of Crebilly Farm at Routes 926 and 202 in Westtown Township turned into he-said-she-said testimonies over stormwater management. That came after supervisors denied a witness who would have testified about battlefield preservation via video conferencing. Also testifying during the Oct. 24 session was James Scanlon, superintendent of the West Chester Area School District. The next session is scheduled for 6 p.m. Monday, Nov. 27 at Rustin High School. According to township solicitor Patrick McKenna, the proceedings that night would focus on public comment. Most of us living in and near West Chester have learned of the pending sale and development of the iconic land in Westtown Township called Crebilly Farm. Born and raised in West Chester, I rode my horse on the property as a young girl. I cannot imagine West Chester without Crebilly Farm and took for granted that it would always be there. Crebilly Farm is part of the Brandywine Battlefield. The threat of mass development of that sacred land woke me up. What began for me as an awareness campaign to preserve our history and push for a better outcome has grown into advocating for open space preservation in my own township, West Bradford. 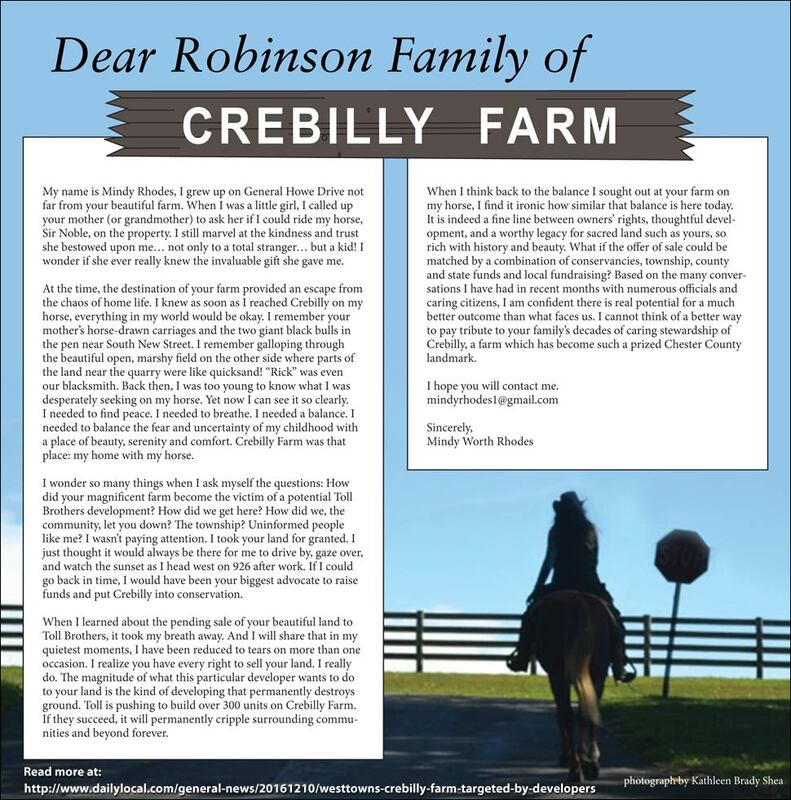 With this letter, I seek to convey the Trust’s concern with the Toll Brothers’ proposed development of the 322.36-acre site known locally as “Crebilly Farm,” located in Westtown Township, Chester County, Pennsylvania. Significantly, this property is situated within the historic footprint of the Brandywine Battlefield. Linda Kaat, a co-chair of this year’s reenactment, said it’s all about the history and that holding the re-enactment on the actual battlefield is a perfect setting for the re-enactors to share their knowledge. The Battle of Brandywine on Sept. 11, 1777 was a crushing defeat for the patriots, allowing the British to take Philadelphia. Long after the war was won, the location of the battle, Dilworth Farm in West Chester, remained unprotected. For the first time, the American Battlefield Land Grant Program is being used to protect farmland–this Chester County battlefield. The battle’s 240th anniversary was marked with 800 re-enactors in Chester County. This one involves a subdivision the company wants to build on a farm in Westtown Township. Opponents say it would ruin the site where the Battle of Brandywine began. It might not have been a true battle, but a solicitor for the planning commission and a historical expert hired by builder Toll Brothers certainly engaged in a war of words during the latest hearing to decide the fate of the controversial plans for Crebilly Farm. With construction proposed at the 330-acre Crebilly Farm, the West Chester Area School District expects the cost to educate an additional 172 public school students at about $645,000 per year for five years. The district used a formula designed to reimburse charter schools since the state does not recognize a per pupil cost. If developer Toll Brothers’ plans to construct 317 homes at Crebilly Farms are realized, the financial hit to the West Chester Area School District will be enormous. Officials said the shortfall will be $645,000 per year once the houses are completed. “Simply put, a public school district cannot fairly shoulder the entire cost of a huge surge of students at one time,” Scanlon wrote. Her initiative grew into a group effort, Crebilly Farm Friends, but it isn’t the only grassroots opponent of the development. There’s also Neighbors for Crebilly, organized by local realtor Elizabeth Roche and businessman Vince Moro. Others like Kathleen Brady Shea of Chadds Ford Live news website and blogger Carla Zambelli of Chester County Ramblings raised awareness. During the recent Westtown Planning Commission meeting, the members recommended conditions to present to the Westtown supervisors. If the developers do not meet the 48 conditions that the commissioners approved of, then the commissioners recommend that the supervisors deny the whole application. Residents who live within 500 feet of the property received a notice in the mail about the proposal and the conditional use hearing held during the Westtown supervisors meeting on Wednesday. Patrick McKenna, solicitor for the Westtown supervisors, noted that about 110 property owners were notified. Proceedings began Wednesday night at Stetson Middle School with 38 people and organizations requesting party status. An entity with party status may question witnesses, present witnesses of their own and appeal the supervisors’ decision. The Westtown Planning Commission meeting Monday focused on conditions to be considered in the proposed housing development at the Crebilly Farm. If the developers do not meet the total of 48 conditions, then commissioners recommend that supervisors deny the whole application. The plan now moves to the formal conditional use hearing phase where supervisors will decide to approve or deny the concept. The first hearing is scheduled for 6 p.m. on Feb. 22 at Stetson Middle School. It is our hope the township and the developer will devise a thoughtful and balanced development plan that does not compromise this incredible piece of American history: conserve the open space and preserve the Brandywine Battlefield. We, the community, need to hold our townships and developers to the highest standards in order to preserve the integrity of unique land such as Crebilly Farm. We remain committed to open space preservation efforts along with aiding our County’s agriculture sector, while encouraging residential and business development in local urban communities. The supervisors unanimously approved the acceptance of a resolution to support Westtown township in its efforts to preserve the 322 acres of the scenic and historic Crebilly Farm. The land, part of the Battle of the Brandywine during the Revolutionary War, created its own battle between Toll Brothers and the Westtown residents in opposition. The plan to develop the land with 319 residential lots would increase the township’s population by about ten percent and increase traffic. The supervisors agreed that the impact on the natural and cultural aspects would bring great dismay. To read Pocopson Township’s resolution,click here. It is indeed a fine line between owners’ rights, thoughtful development, and a worthy legacy for sacred land such as yours, so rich with history and beauty. Westtown Township is a very special community-with many historic buildings, natural creek valleys, tree-canopied roads, beautiful homes, vibrant schools and rolling farmland. While Westtown Township has experienced great change over the last decades, the change has been accommodated in a manner that maintains this special character and a feeling of being close to nature. Westtown is worthy of continued special efforts to carefully guide and preserve the most important features of the community. These are not my words, although they could be: This is the mission of the Westtown Township Growth Management Plan. Other speakers delivered impassioned pleas to avoid marring the property’s scenic and historic resources. A West Chester University student and combat veteran said new research points to Crebilly as the location where the first shots were fired by Hessian forces. “When it’s lost, it’s lost forever,” he said. Some area residents have suggested that a subdivision would irrevocably ruin the property’s scenic vistas and historic grounds, which were traversed by Revolutionary War soldiers. “Once it’s gone, it’s gone forever,” said Rhodes. She stressed that she’s not anti-development and firmly believes that Crebilly’s owners should be fairly compensated. However, she also maintains that every effort should be made to protect such hallowed ground.